I wanted to know the fastest class in the game in using spinning and spelling without having to set ahk or synapse to specific ms what would be for use with macros? to press repeat key manually? Not sure if this is what you looking for. thank you for your reply, you were looking for the speed of running rotation/spell and I seemed to see that between the dps the fury war is very fast as a style of play. I ask because with gse pressing manually to series the war fury would seem to behave strabene. This is really a macro specific thing. A lot of macros are built with the expectation that you are spamming the key faster than the GCD. If you are then manually pressing your macro would need to be rewritten to accomodate that expected behaviour. Downside to that is it counts passive ticking abilities. Such as rushing jade wind or Whirlwind. how to be written to press how I manually timotyluke I did not understand? You could explain why in your previous post you said that macros are set for certain ms of speed and use programs (ahk, synapse etc. ). 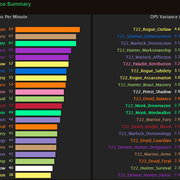 Unfortunately I don’t think I understand some differences yet with wow bfa and gse macros. in legion the macros were very good exact gdc used spell with precision, and everything ran smoothly. bfa la blizzard a cambiato qualcosa I don’t know what it is but it seems that macros go slowly, that’s a way to remove macros from the game? I noticed that many say that the sequence /castsequence no longer works as it should now, the gdc must be put both in premacro and in normal sequence, going to deteriorate in fact their use without accuracy. But definitely I’m not using external programs to automate keybinbdare running speed I’m feeling really bad right now. I find the macros and gse a really fantastic type of game, but also use automatisms for keyboards and mouse, is too exaggerated for me. in the end move only the pg without doing anything. GCD Changes – A lot of Cooldowns and things like trinkets were NOT on the GCD in Legion. They now are. What this means is that you cant stack things like cooldowns and trinkets at the same time. castsequence was also removed from the game and added back into the last few weeks of beta. It is not operating the same as it did in Legion and is very susceptible to lag. Someone from a different server in can through server lag break castsequence. Castsequence is not something that GSE has any control over. It just does what it does and if it doesnt work well its simply bad luck. Now the priority macros in particular are written to take advantage of the fact that its not going to execute in the order that the macro is written. That macro will execute Cast 1, Cast 1, Cast 2, Cast 1, Cast 2, Cast 3 etc and it works because it expects that those abilities are going to be on cooldown and unavailable most of the time. If you then press that one by one its going to be executing way outside of the order that is intended to be executed and your results are going to be different. You are then going to have to write a different macro that expects that you press and wait and press and wait. If you dont get that part of stuff then I cant help you. I cant explain it any simpler than that. It is a significantly complex situation and if you look back at my last 808 posts most of them are on trying to explain this. I have not idea what you are trying to say in this part. “bfa la blizzard a cambiato qualcosa I don’t know what it is but it seems that macros go slowly, that’s a way to remove macros from the game? The short of it is DONT PUT GCD Abilities in KeyPress and your macro has a 100% chance of working. Put GCD abilities in KeyPress without modifiers and you have a 0% chance of your macro working. This has nothing at all to do with PreMacro. PreMacro and PostMacro work exactly the same as the did in Legion. They are part of the internal loop macro type. Thank you for your answers and your courtesy. /cast instead of castequence, because of the accuracy? as well as priority lists for a certain aspect it makes little sense to do it because it could skip the lines often.